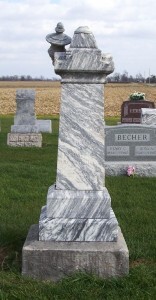 This is the tombstone of Catharina Heinz, located in row 5 of Zion Lutheran Cemetery, Chattanooga, Mercer County, Ohio. The gravemarker is inscribed: Catharina, Ehefrau von [wife of] of Christ. Heinz, geb den [born the] 25 June 1828, Gest den [died the] 18 May 1888, Alter [age] 59y, 10m, 23t [days]. I featured the tombstone of Catharina’s husband Christian last week. His marker is next to hers. The spelling of their surname was not consistent in the records. It was spelled Heintz, Heinz, Hines and other ways. The name is even spelled differently on their tombstones. His is spelled Heintz and hers is spelled Heinz. According to Zion’s records Catharina was the daughter of Philipp and Charlotte (Baus) Oberkircher, born 25 June 1828 in Altstadt, County Homburg, Rheinpfalz, Bavaria. She was baptized and confirmed there and came to America in 1852. She was the wife of Christian Heinz. Catharina died 18 May 1888 after lingering and severe suffering. She was aged 59 years, 10 months and 23 days. Burial was on the 20th. Christian and Catharina were married in Franklin County, Ohio, on 19 June 1853. (Franklin County Marriages, Vol 6:42). They were living in Hamilton Township, Franklin County, PO Columbus, in 1860 and were enumerated in the census there as ‘Hines”. The value of Christian’s personal property was $600. (1860 US census, Hamilton, Franklin, Ohio, M653_963:223) They had one child that died at a very young age. Lorren Caffee remarked that he remembers Christian Heintz’s large tombstone. He asked if there was any information about what Christian did for a living or the extent of his land holdings. I was glad he asked the question. It prompted me to do more research and I discovered some interesting things. The Heinz family was a little difficult to locate in census records, probably because of the spelling variations of their name. I did find their farm on the 1876 and 1888 maps of Blackcreek Township. Christian Heinz was a farmer. His 80 acre farm was the north half of the southeast quarter of Section 17 in Blackcreek Township, Mercer County, Ohio. His farm was just a few miles north of where I grew up. Rockford West Road borders the north part of what was his property. The 80 acres to the south of them was owned by A.M. [Andrew] Kallenberger. But I remember the Kallenbergers living on Rockford West Road and the boys getting on the school bus there. That was the north part of the section 17. I decided to take a trip to the courthouse to look up some land deeds. Christian Heinz bought the NW ¼ of the SE ¼ of Section 17 [40 acres] from Jacob Heller/Holley on 1 October 1862 for $335. (Mercer County Deeds, Vol: 4:374) He purchased the NE ¼ of the SE ¼ [40 acres] from B & I RR Co [Bellefontaine & Indiana Rail Road Company] on 8 January 1865 for $300. According to the deed, B & I RR consolidated with the Indianapolis, Pittsburgh & Cleveland Rail Road Company on 22 December 1864. (Mercer County Deeds, Vol 9:42) Evidently someone had plans for a railroad there. Maybe that was the same train that was supposed to go through Chattanooga at one time. Christian sold his 80 acres to Andrew Eichler on 24 January 1889, about nine months before Christian passed away. Andrew Eichler passed away in 1894 and the land went to Leonard Eichler. Leonard sold the land to Laura Musselman in 1897. 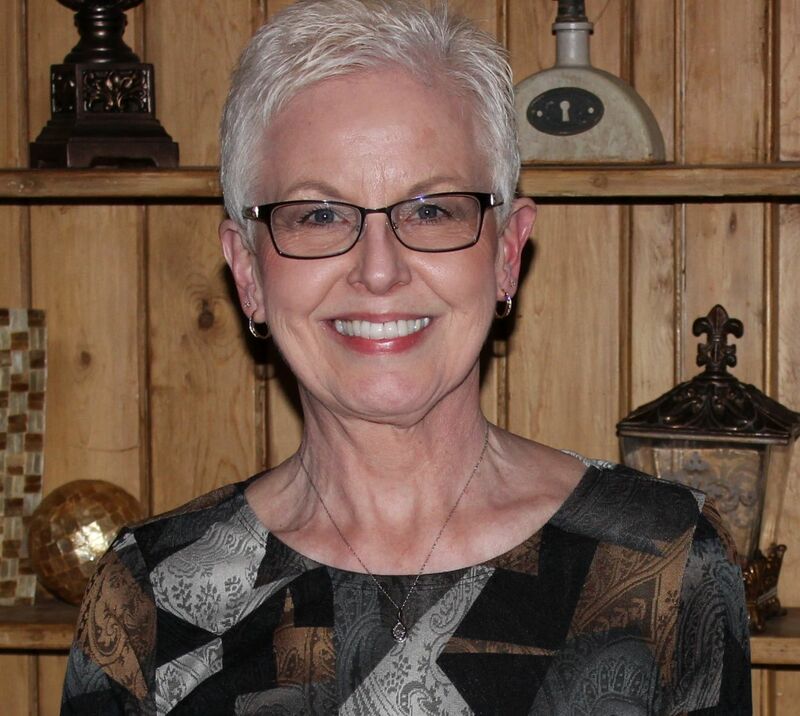 Maggie (Rueck) Kallenberger, wife of Mike [son of Andrew] purchased the land in 1910. That is how the Kallenbergers came to own the whole southeast quarter, which includes the land along Rockford West. 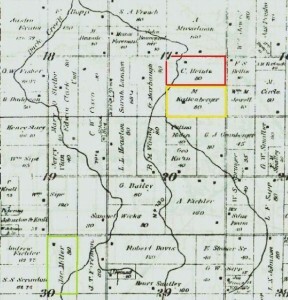 Christian Heintz farm (red), Kallenberger farm (yellow), Jacob Miller farm (green), Blackcreek Twp, Mercer County, 1888. Don Caffee said that his parents, Howard and Caroline (Miller) Caffee, lived in the house on the north 80 acres when they were first married. They married in 1914. Howard and Caroline’s son Vernon was born there in 1915. Andrew Kallenberger purchased his south 80 acres from William Foreman on 30 August 1864. (Mercer County Deeds, 7:471) The Kallenbergers lived in house on the south 80 acres for many years. After the 1920 tornado destroyed that house Mike and Maggie Kallenberger moved into the house on the north 80. And that is how the bus came to stop at the house along Rockford West to pick up the Kallenberger boys, Mike and Maggie’s grandchildren. The Kallenbergers had lived in the north house ever since. My connection to all this: Caroline (Miller) Caffee was the sister of my grandfather Carl Miller. Their parents were Jacob & Christine (Rueck) Miller. Caroline and Carl were half-siblings to Maggie (Rueck) Kallenberger. Maggie was Christine’s daughter, born in Germany. Land: owned 80 acres, 50 acres tilled, 5 acres of meadow, 30 acres of woods. Value: $2500, including buildings; $150, machinery; $260 livestock. Farm labor paid in 1879: $150. Value of all farm products sold in 1879: $450. Cattle: 3 milk cows; 8 other, 1 calf dropped, 1 cow purchased, 2 cows sold. Milk products: 900 gal milk sold in 1879, 300 lb butter made on 1879. Crops: Hay, 8 acres; Indian corn, 24 acres/700 bushels; oats 4 acres/100 bushels; wheat 11 acres/240 bushels; Irish potatoes ½ acre/ 50 bushels; 1 acre apple orchard, 20 bearing trees/30 bushels. Forest Products: 30 cords of wood cut in 1879, $30. 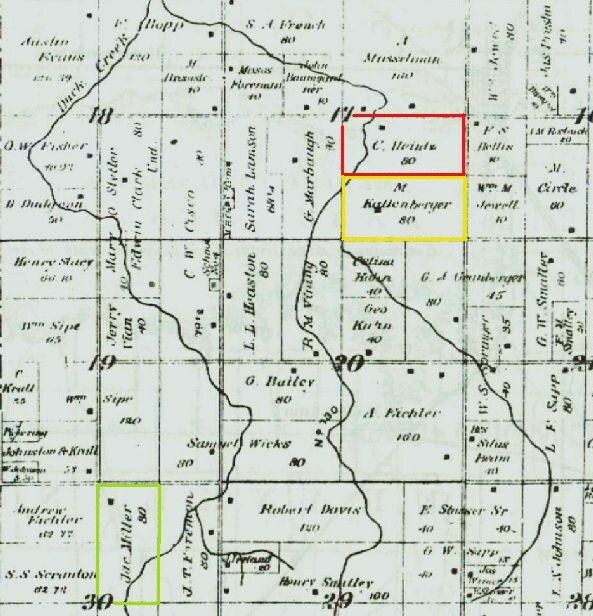 Heinz/Heintz was not a common surname in Blackcreek Township. Although Christian and Catharina had no descendants their story lives on.